A table in Barbara’s lounge is filled with family photographs, showing her four grown up sons, three now married with children of their own. Pride of place is given to a recent picture of her youngest son, as he graduated from his teacher degree last November. “He is now working as an IT teacher at the sixth form college 5 miles away, and it is such a relief that he has found his niche in life at last,” says Barbara. Nick is a healthy, fit and capable 26 year old, of high intelligence and very motivated – so it is surprising that Barbara speaks of him in this way. When she mentions that he is colour blind, this seems irrelevant as being colour blind is not really regarded as a serious disability or handicap. “Perhaps it should be though; colour blindness affects every aspect of your life and it is a lot more restricting than people tend to think,” she says. 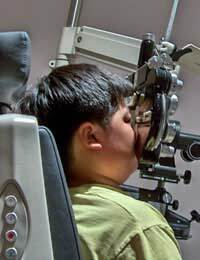 Nick’s routine eye tests at school first alerted his parents that he was colour blind in the red-green colour system. To him, red and green objects look the same colour, and he has trouble distinguishing between them. “He was doing well at school, reading fine, getting good grades in most subjects so we weren’t really worried. He was very keen on fitness and, when he was about 15 started thinking about what he wanted to do as a career. His elder brother is in the Royal Navy and Nick became very keen on the idea of joining the army. I wasn’t that keen but I still felt for him when, of course, his colour blindness made him ineligible. The same went for the police, which was his next choice,” explains Barbara. Once he had accepted the limitations of his colour blindness for military careers, Nick began to think seriously about working in IT and decided instead to become a web designer. “This is when we began to see exactly how important full colour vision is – after Nick had finished his A levels he was accepted on a course at Loughborough and really enjoyed his first year. Or so we thought. He did really badly in his exams at the end of the first year and when he came home, he announced he wasn’t going back to complete his degree,” says Barbara. Although he had enjoyed the life generally at university, Nick had really struggled with the computer work because he could not see a different between green and red images on screen. “There is a website called Vischeck – you can google it and find it easily – this shows you what a screen looks like to someone who is colour blind and it’s quite an eye opener. Not being able to see different colours really affects the way you see websites on screen, and to a web designer, not seeing what everyone else sees is a disaster,” she explains. Rather than see their son unemployed and with no prospects, Barbara and her husband Geoff arranged to see an ophthalmologist and asked him if anything could be done. “There is no cure for colour blindness and no special lenses that you can wear but he did tell us that there are tools that can help and the first thing that Nick needed to do was tell his lecturers at university. It turned out that he hadn’t mentioned it at all, so they had no idea...” she says. Before the start of the next term, Nick went back to Loughborough and saw his main tutor and explained about his colour blindness. “They were annoyed because he hadn’t told them – they had just assumed his poor grades were because he wasn’t that committed. When they found out, they told Nick that the IT department had many different tools that could help, including a pixel checker – I don’t know the proper technical name – but it displays the name of the colour whenever you point your mouse at an object on the screen,” she says. After two years, which were not easy by any means, with the help of his tutors and more tools, Nick graduated with a decent grade and then surprised everyone by deciding to stay on another year to get his teaching degree. “All of his experiences made him want to teach others about IT, and do it by making people more aware of the importance of colour vision. He has a true vocation now and we are very proud of him,” smiles Barbara.